The Woffles Wu saga - Raw facts to help you evaluate Woffles punishment. 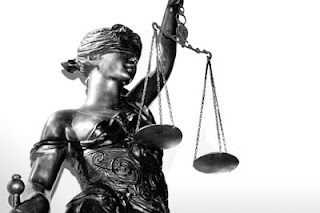 For those unfamiliar with this symbol, she is called “Lady Justice”. You could probably make an intelligent guess why she is blindfolded. Yes, it means in judgement, she is blind to the fact of who you are, social status, wealth etc. It also means that she is blind to the fact of whether or not the punishment is “too severe” or “too light”. Guidelines for punishments are clearly written and will be delivered accordingly. Here is some raw data you might want to use. Some basic facts to help you evaluate Woffles’ punishment. Whether the punishment is “fair and deserving” is another matter altogether, a matter that could be contaminated by personal judgement. So, is the punishment fair? – Yes. Is it deserving? – I’ll chose not to answer that. aiyar.. as the saying goes: if you live by the sword, you die by the sword. I saw the video – terrible showing by opposition. They have to resort to interruptions, pointless accusations and making silly faces where they could not argue good points. Has no one thought to ask why this seemingly trivial case has come to light after six years? I am a Los Angeles-based reporter who knows Dr. Wu and who has been appalled by the shoddy coverage his case has received in the Singapore press. These are the facts that have been disregarded: In 2010 a member of Dr. Wu’s staff, Teresa Wong Chui Sheung, his receptionist/cashier, was arrested on charges of embezzling more than $111,000 from Dr. Wu by pocketing money from his patients. Following the arrest, she pleaded with Dr. Wu to have the charges dropped. When he refused, she and her boyfriend at the time threatened revenge. She, of course, was privy to office discussions between Dr. Wu and Mr. Kuan concerning the speeding ticket. (Mr. Kuan, by the way, is no ordinary office employee. He is Dr. Wu’s godfather, a lifelong and loving friend.) Unless he dropped the charge against her, Dr. Wu recalls her saying, she would inform on him to the authorities. Dr. Wu says he regarded her threat as a form of blackmail and remained steadfast in his determination to put his treacherous former employee behind bars. In the end, she was sentenced to 15 months in prison — and immediately made good on her threat. And that’s how it happened that nearly six years after the original offense occurred, Dr. Wu was charged with “abetting” Mr. Kuan in giving false information to police. Far from receiving favorable treatment because of his wealth, it is clear that if he were not wealthy, there would have been no one to accuse him, and the matter would have remained moot. (I should mention that here in Los Angeles and in 24 other U.S. cities radar cameras have been outlawed because they shift the burden of proof to drivers rather than law enforcement, flouting the precept that one is regarded as innocent until proven guilty.) But the deficient reporting on Dr. Wu’s case has encouraged a campaign to smear his good name. Until now, he was regarded as one of Singapore’s preeminent figures. What is not so well known about him is that in addition to his many public accomplishments, he frequently donates his time and talent to performing cranial-facial restructuring on poor children in underdeveloped countries. Now, some of his accusers have even proposed that his license to practice medicine be revoked. All for an offense that would not have been prosecuted in some parts of the world — including this one — and that never would have come to light had it not been for the vindictiveness of a convicted embezzler. Dr. Wu was charged with “abetting” Mr. Kuan in giving false information to police. Answer: Dr Woffles Wu has been CONVICTED. Please remove the quotation mark of “abetting”. Convicted of abeting. Thats the end. Conclusive. Thats it. All for an offense that would not have been prosecuted in some parts of the world — including this one — and that never would have come to light had it not been for the vindictiveness of a convicted embezzler. Answer: In CONTEXT, since this criminal offence of abetment happened in Singapore, it is therefore under Singapore Law that Dr Woffles has been convicted of the abetment crime. And thats it. No more argument and dispute on this area. You mentioned in some parts of the world. I like to bring to your attention once and again that the two key legal words are “In Context” and in this case, please do not worry on other parts of the world. Since the offence happened in Singapore, that is it. Understand?? Please reply the facts, as per your website stated “Raw Facts”. So, please state the raw facts !! Since you protrayed Dr Woffles Wu as so righteousness, do you know that he was also separately CONVICTED under the Singapore Medical Council (SMC) Law of sending his patients to purchase creams to the third-party vendor, the Second Wife of Dr Woffles Wu’s biological father, named Ms Josephine Law, instead of purchaseing from the Singapore General Hospital (SGH) Pharmacy, since at that material time, Dr Woffles Wu, was a Consultant Plastic Surgeon, and LEGALLY employed with and by SGH. Do you know now ?? You may check and verify this with the Singapore Criminals Records section if this is true. On the issue of Dr Woffles Wu fined S$1000.00 for asking his staff cleaner named Mr Kuan Yit Wah to take the rap. Before Dr Woffles Wu was successfully convicted, NUMEROUS interviews were done at the CPIB and at several times, the CPIB said that this case was closed already. Without my own international media friends, UN, USA President Obama, and other international parties for their assistance, I would safely say that this case would not have come to light. At that time, I have sought the UN and the USA President Obama for assistance. But I have to tell you now that whether they intervene or not, I do not know. How they do that, they have not revert back to me and I do not know. But I have strong reasons to believe that since the CPIB have told me and several of my friends that this case was closed, now that Dr Woffles Wu was convicted, then it must be the external super powers who have assisted in one way or another. Make sense?? You mentioned that Dr Woffles Wu did volunteer work in Myanmar and Indonesia to repair cleft lips. You did not specify the dates or period. So, the readers would reasonable assume that either this was done on a regular basis or quite recently. But do you know that this volunteer work actually took place about in year 2000 when Dr Woffles Wu was a Consultant Plastic Surgeon with the Singapore General Hospital (SGH)“J” Clinic ?? And that was BEFORE he came out into private practice at the current Camden Medical Centre after about the year 2000. Since he came into private practice at Camden Medical Centre, he did NOT do any of this type of volunteer work any more overseas. On the topic of cleft lips repairing, do you also not know that this is not a one-off type of surgery. A child who is born this way, would need multiple surgeries, preferably with the same surgeon who operated on him/her and follow-up for at least a couple of years later. Therefore, do you think that he got this type of time to do it?? Also, do you also not know that around that year 2000 or so, he was fined about S$2000.00 by the Singapore Medical Council (SMC), the same authority who currently medically suspended him, for asking some of the SGH patients who consulted Dr Woffles Wu when he was in the employment with SGH, to go to Mdm Jospehine Law (the first concubine of Dr Woffles Wu’s biological father) to buy creams or some other cosmetic products INSTEAD of purchasing them directly from the SGH Pharmacy. I am sure you missed this juicy part. You can write in to the Singapore Medical Council (SMC) to enquire if this is accurate. In the event that your querry is not answered in any ways, most probably it is being covered up by SMC. I teach you a trick or workabout on this. You ask your international media counterparts to enquire directly with the SMC. With the international media, the SMC would have think twice before not answering back to your international media. Wa, smart la. No choice. If I can win until this stage, without being involved in any legal matters myself, I must have some (or a lot of) tricks under my sleeve, you know. Next, on the Pro Bono work as reported by youself, not sure if Dr Woffles Wu said them himself. Do you also not know that his fees are one of the two highest, in comparable with another Plastic Surgeon named Dr Martin Huang in Paragon Medical. If Dr Woffles Wu is indeed into charity, why would he set his fees so high SINCE HE MOVED OUT INTO PRIVATE PRACTICE ?? Any common sense so far ?? Does it make any sense?? Do you think that in fact, would SGH allowed him to do Pro Bono there?? The doctor who does the mitigation for Dr Woffles Wu during that cream incident is the current SGH Senior Consultant Plastic Surgeon, Prof S. T. Lee. Once and again, please ask your international media counterparts to verify directly with SMC. One more common sense question – Do you know of anyone in Singapore, maybe you friend, who only got fine of S$1000.00 for speeding and ONLY AFTER about six calendar years LATER ?? Even that, does the Law Minister or AGC came out into the public to give Press Release, Media Interviews and even heatedly debated in Parliament, for a simple Speeding Offence??? To the best of my knowledge, NONE since Singapore Independence in 1965. And I believed that with that cream incident, SMC think really cannot give chance anymore and he was medically suspended for Fraud and Dishonest and tarnishing the good reputation of the medical profession. Hope this helps in your additional truth reporting about this Dr Woffles Wu again in your next upcoming articles in the local newspapers. You can go along this lines and if you can dig out more facts, through you international media counterparts, then I think that you would be awarded the Media Person of the year by MediaCorp. Sure one. Anything dealing with Dr Woffles Wu, sure become high profile case and news one. The Straits Times EDITORIAL Opinion Section. No plastering over this blemish. Published on Apr 12, 2014 6:00 AM. The case of a senior doctor who got an elderly employee to lie to the police – so the former could duck two speeding offences – raised issues of considerable import, like lay perception when punishment meted out by the courts fails to assuage public disquiet and proportionality on legal grounds. Attorney-General Steven Chong noted at a forum that in the inglorious case of plastic surgeon Woffles Wu, “much of the furore stemmed from a lack of understanding of criminal procedure and criminal law”. Many views were aired within a few days following Dr Wu’s conviction and fine of $1,000 – including a blog by the head of the Government Parliamentary Committee for Home Affairs and Law, Mr Hri Kumar Nair, who asked for the grounds of the decision to be made public. The Attorney-General’s Chambers subsequently explained why a more serious charge was not preferred on the facts of the case and the need for aggravating features to invite a jail sentence. The matter, including the legal precedents, was also discussed in Parliament two months later where Law Minister K. Shanmugam stressed that no one is above the law. Few doubt that. Even so, given the dishonesty shown by a professional of some standing, a moral judgment cried out to be articulated, particularly because of the doctor’s singular “lack of remorse”. That expectation was fulfilled by the Singapore Medical Council (SMC) when it suspended the prominent doctor from practice for four months and published the grounds of its decision. The views of the council should be required reading for practitioners and students alike as it sets out why doctors must be held to account in non-medical matters as well, in this case, for subverting the course of justice. Though ethics in the profession date back to the Hippocratic Oath, one might well wonder why the doctor, with 28 years of experience, gave “no second thought” to his egregious actions and even alleged that other doctors also gave false information for similar offences. Instead of spending part of his suspension on community work or reflecting – perhaps at the Centre for Medical Ethics and Professionalism – on the discussions his case provoked, he reportedly plans to write a musical, play the piano, train for squash tournaments and go on a holiday. Such a response suggests that the SMC’s bitter medicine has not had its desired effect. The SMC was right to emphasise that “every medical practitioner is expected to carry the hallmarks of integrity and honesty whether in his professional or personal capacity”. The profession must uphold the highest standards if it is to continue to enjoy the trust and respect of the public. Dr Woffles WU Tze Liang. Since Dr Woffles Wu has been currently suspended for four (04) calendar months by the Singapore Medical Council (SMC) said that this was an offence involving fraud or dishonesty. Dr Woffles Wu’s name was not found in the Singapore Medical Council (SMC) directoy listing as he is currently serving his four (04) month medical suspension and according to SMC, they said that this was an offence involving fraud or dishonesty. Enough already and need any more saying ?? Are you worried being treated by that doctor whose offence was involving fraud or dishonesty ? For your IMMEDIATE BLACKLISTING of Dr Woffles Wu Tze Liang, Singapore Pink NRIC S1409986G, FORMER Consultant Plastic Surgeon and Medical Directorfrom Woffles Wu Aesthetic Surgery Centre.